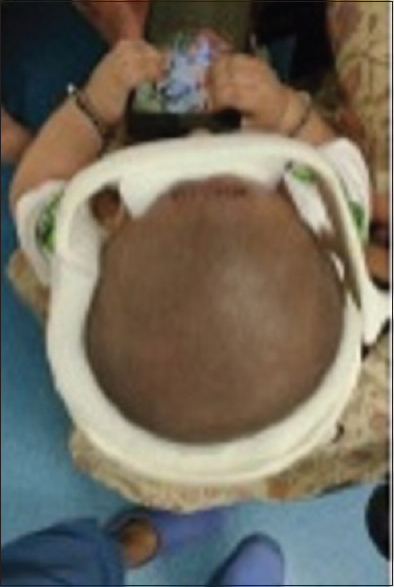 Premature fusion of one or more sutures of the cranial vault results in craniosynostosis, leading to abnormal head shape with possible limitation of the brain growth. Among all the mammals, the human baby is born much early in the developmental phase of the brain and as much as 80% of the brain development happens in the first year of life which is facilitated by the open suture lines. There is excellent coordination between the opposing forces of cranial vault expansion fuelled by continual brain growth and the growth plate of these suture lines which promote fusion. Early fusion of the suture limits brain expansion across it (Virchow's law), thereby forcing the brain to push parallel to the suture. Such a shift results in the development of an abnormally shaped skull. In the Indian scenario, premature fusion of coronal suture is the most common, followed by metopic suture. 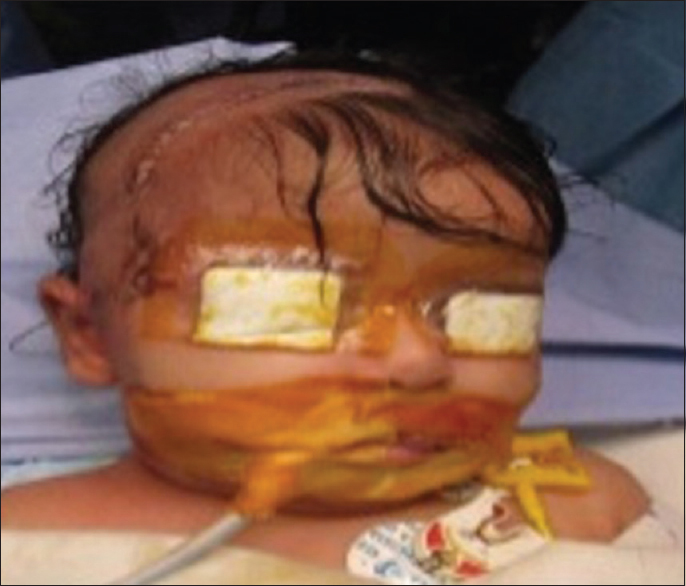 Craniosynostosis and its associated abnormalities pose technical challenges to craniofacial surgeons. The best possible techniques,,,,,, to correct this deformity have undergone periodic evolution since the time Lannelongue introduced the first open technique in the 1890s. The open calvarial vault surgeries need extensive bone cuts and have longer incision, increased facial edema, higher blood transfusion rates, and longer duration of hospital stay. 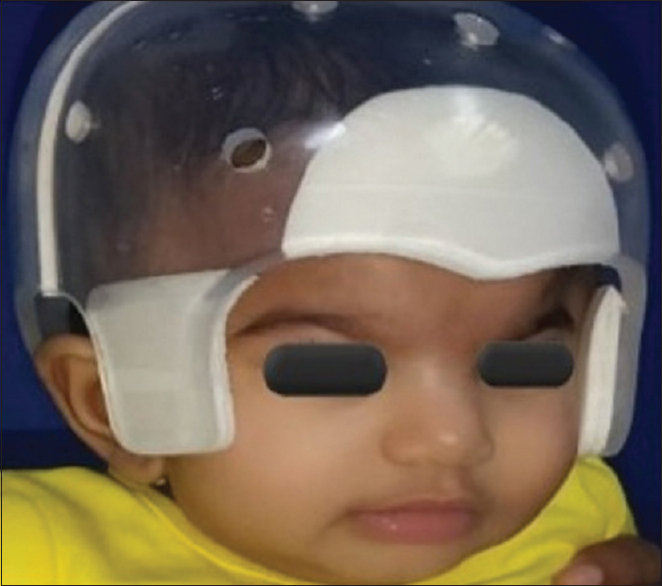 To alleviate these concerns, Jimenez and Barone introduced the minimally invasive approach to treat infants at an ideal age before 6 months and followed it by the use of a specially designed cranial helmet for 12 months. The author is the first one in India to perform and propagate endoscopic surgeries for craniosynostosis repair, following his craniofacial fellowship training in the United States. This procedure is still in the nascent stages in India, and we wish to share our experience and challenges in the Indian context. 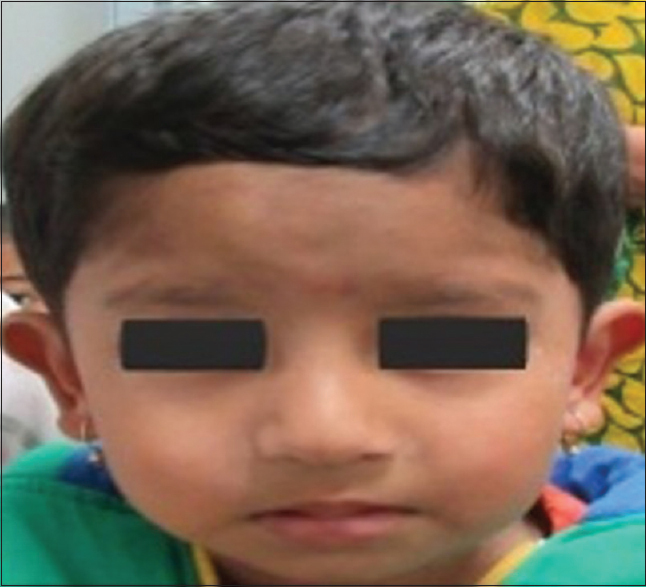 Here, we present our experience on six patients with anterior craniosynostosis (metopic, unicoronal, and bicoronal) corrected endoscopically. Cranial bones are thin in early infancy and release of fused suture by bony resection is possible with minimal access incisions. This resection provides space for brain growth. The force of rapid brain growth of infancy, then pushes the calvarial vault and this process is guided by custom made cranial helmets to enable a focused correction of the abnormal head shape. The objective of this article is to present the senior author's experience of introducing this surgical technique with a full case series of consecutive patients demonstrating objective outcome data. Goal: The goal of this technique is to excise the entire fused metopic suture segment extending from the anterior fontanelle to the nasal bone including the nasofrontal suture [Figure 1] and [Figure 2]. After induction of general anesthesia, the baby is placed supine with head supported in a horseshoe headrest (Mayfield). The entire scalp and face is prepped and draped in a watertight fashion. 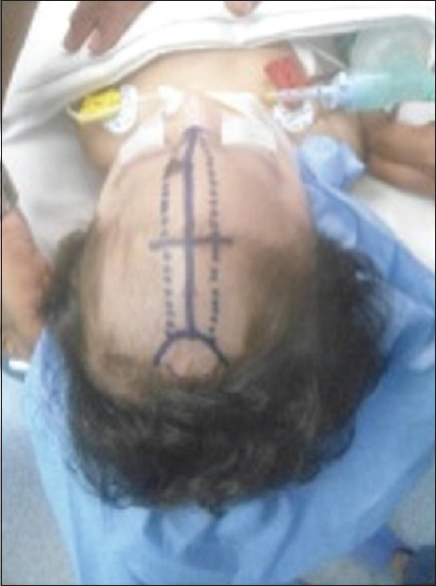 The skin incision is transverse, immediately behind the anterior hairline, 2–3 cm in length placed in line with the fused metopic suture [Figure 3]. The proposed incision and area over the fused suture is infiltrated with a combination of 2% lignocaine with adrenaline and 0.25% bupivacaine. The skin is incised down to the periosteum, and a subgaleal dissection is performed with tenotomy scissors superiorly up to the anterior fontanelle and inferiorly up to the nasofrontal suture. A minimum of 2-cm wide strip of the bone [Figure 4] from the anterior fontanelle up to the nasal bone beyond the nasofrontal suture is marked for excision. The pericranium is separated over this strip to expose the bone. Burr holes are then drilled over the center of this strip, two each on either side of the fused suture and connected across the midline. 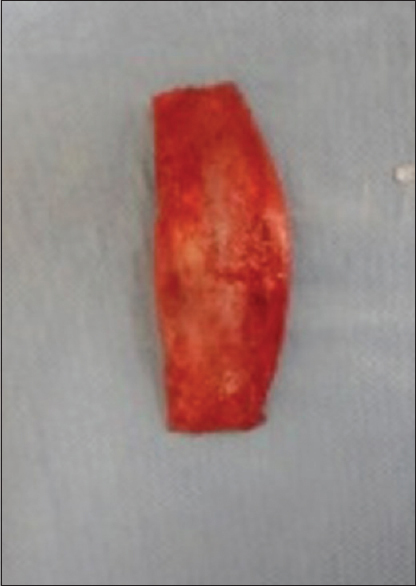 This small block of the bone is removed to expose the dura. A zero-degree thin endoscope (2–3 mm) [Figure 5] and [Figure 6] is then passed through this opening under the bone, and under vision, the dura is separated from the inner table along the entire strip. 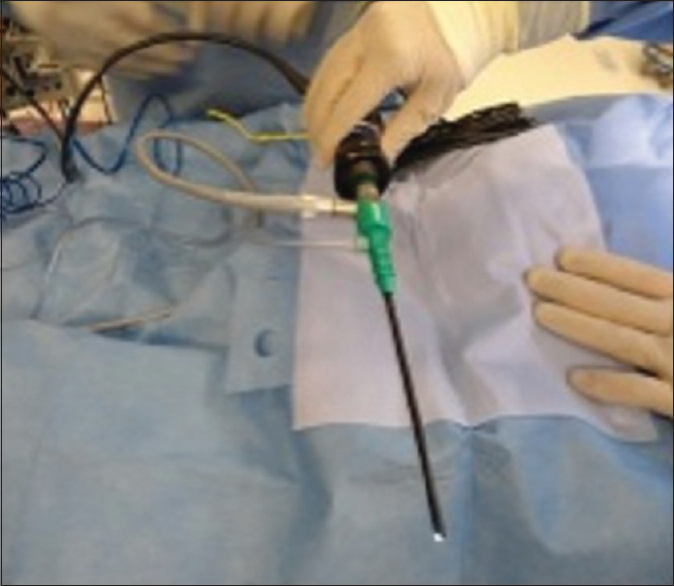 Large vessels are cauterized under vision with a bipolar cautery for effective hemostasis. During this process, meticulous care is taken to visualize any large vessels coming from across the sagittal sinus. After freeing up of the dura, the entire strip of bone from the anterior fontanelle to the nasal bone including the nasofrontal suture is excised [Figure 7] with roungers and bone cutters. Occasionally, it is possible to cut the bone with large Mayo scissors, as the bone is extremely thin, especially if the surgery is performed at an early age before 3 months. End point is reached when one has crossed the nasofrontal suture [Figure 8] and is able to palpate the bone gap from the anterior fontanelle to the nasofrontal junction. Hemostasis from the cut bone ends is achieved with bone wax (Ethicon) and bipolar diathermy. This is the major source of postoperative bleeding, and it is important to ensure all the edges are completely dry before skin closure. The skin incision is then closed in layers using absorbable sutures, and a tissue adhesive is applied over the closure (Dermabond, Ethicon) [Figure 9]. A small nonadherent dressing applied. The baby is extubated and shifted to a neurosurgery intensive care unit for overnight observation. Adequate analgesia is provided to keep the patients comfortable and feeding is started when the baby is alert. Goal: The goal of this technique is to excise the entire fused coronal suture segment from the anterior fontanelle up to the zygomaticofrontal suture [Figure 10], [Figure 11], [Figure 12]. The horseshoe headrest supports the head as the baby is placed supine following induction with general anesthesia. Hair is trimmed over the entire fused suture. A linear skin incision in line with the coronal suture line is planned over the fused suture about 2.5 cm in length midway between the anterior fontanelle and the pterion to get access to the zygomaticofrontal suture [Figure 13]. The incision is infiltrated with a mixture solution of 2% lignocaine with adrenaline and 0.25% bupivacaine. The entire scalp and face is prepped and draped in a watertight fashion. The skin is incised and a subgaleal dissection performed with fine tenotomy scissors all along the fused suture segment. A 2-cm wide strip of the bone involving the fused suture is marked extending from the anterior fontanelle to the zygomaticofrontal suture [Figure 14] and [Figure 15]. This strip, which needs to be excised, is stripped off of its pericranium. Burr holes, two on each side of the fused suture, are drilled on the middle of this bony strip, connected, and the bone block removed to expose the dura. A zero-degree thin endoscope (2–3 mm) is then passed under the bone and the dura is separated carefully from the bone under vision all along the fused suture. Any large vessels encountered are coagulated using a bipolar cautery under vision for adequate hemostasis. The entire strip of the bone is then excised up to the zygomaticofrontal suture using roungers and bone cutters [Figure 16] and [Figure 17]. Excision of the greater sphenoid wing provides a difficult challenge due to its thick nature and its intimate relationship with the dura. End-point is reached when one is able to see the periorbital fat clearly and one is able to palpate the entire gap of the bone from the anterior fontanelle to the lateral orbit. Hemostasis from the bony cut ends is achieved using bone wax (Ethicon) and bipolar diathermy. The skin incision is then closed in layers using absorbable sutures and a tissue adhesive (Dermabond, Ethicon) is applied [Figure 18]. A small nonadherent dressing is applied. The patients are then extubated and shifted to a neurosurgery intensive care unit for overnight observation. Adequate analgesia is provided to keep the patients comfortable, and feeding is immediately started when the baby is alert. Helmet therapy can be started within a week following surgery. 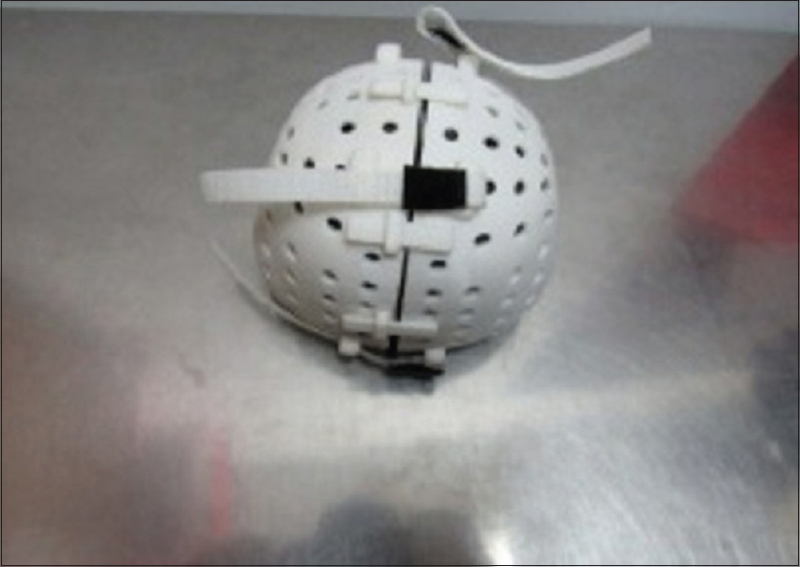 Monitored use of helmet forms the key in endoscopic-assisted surgery for obtaining the desired result. The helmet is designed in such a way that it guides the calvarial growth only in the specific dimension, thereby aiding in achieving desired calvarial shape. Consequentially, noncompliance or improper shape and size of helmet can impair desired effect. Ideally, the helmet should be started within 1 week following surgery but can be started up to 2 weeks after the surgery. Helmeting is continued for about 12 months as the head shape takes approximately 1 year to achieve a normal head shape. The child is sent to an orthotist partner in our city to measure the dimensions of the head using infrared STAR scanner (courtesy: Kare Prosthetics and Orthotics). The images are then sent to the US location (Orthoamerica, Orlando, Florida, USA) and fabricated, which is then shipped back to the hospital. The helmet is made from resin and is imported from manufacturing facility in Orlando [Figure 19] and [Figure 20]. It is designed such that it is in contact with the vault in all places except in the region where the desired growth is necessary [Figure 21]. Usually, a child requires up to 2 or 3 helmets over the follow-up period of 12–15 months due to change in the vault size and rapid brain expansion. It has to be used 23 h a day for all 7 days a week, and strict compliance from parents is essential for the success of the procedure. 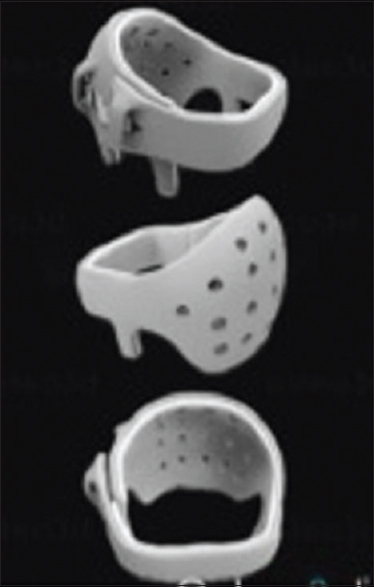 If cost constraints are a major impediment, the helmet can be designed using three-dimensional (3D) printing technology [Figure 22], [Figure 23], [Figure 24], such as the first case that was done (courtesy: Osteo3D, Bangalore) [Figure 25] and [Figure 26]. 3D printed helmets, manufactured in Bengaluru, India, are custom made and heavier but lesser priced as compared to formally made orthotic helmets. 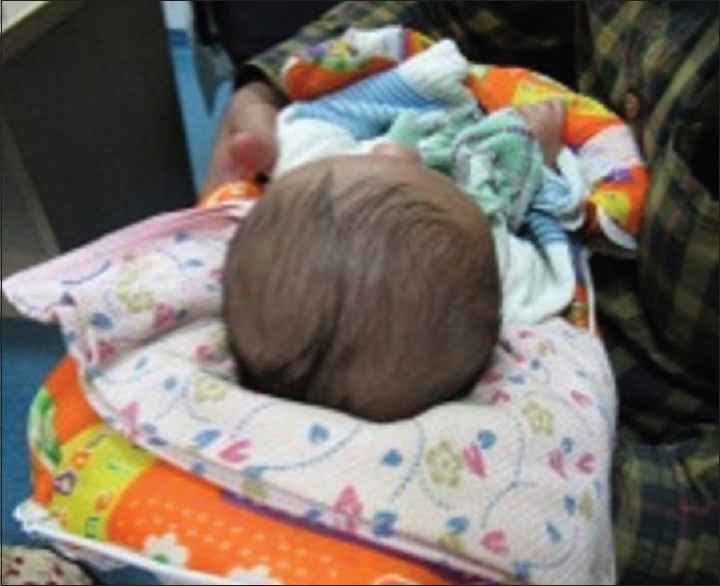 Six patients diagnosed with craniosynostosis who underwent endoscopic correction were studied. Three babies among them had metopic craniosynostosis, two had bicoronal craniosynostosis, and one child suffered right unicoronal craniosynostosis. Each of these procedures is discussed separately to highlight the variation in the technique as per the suture involved. The age group of the patients was between 84 and 100 days postbirth. Computed tomography scanning of the head was performed for all babies [Figure 2] and a 3D model of the skull was made with the help of 3D printing (courtesy: Osteo3D, Bangalore). There are real benefits of the skull 3D model, as these real-life size models enable accurate tracing of the suture on the operating table and anticipating difficult areas by looking at the model [Figure 15]. 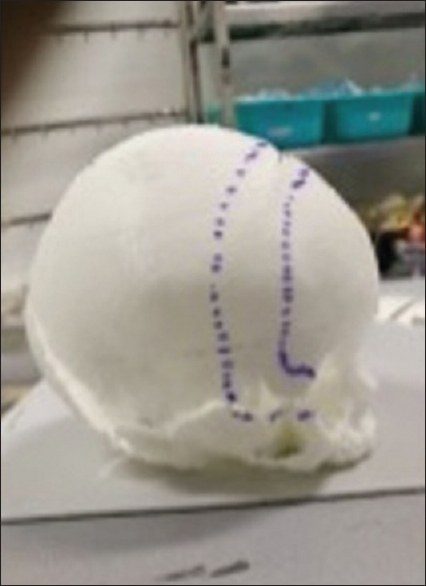 Planning for the skin incision and marking were made on the preoperative 3D model of the cranial vault which was then autoclaved and sterilized for the surgery. In all patients, the skin incision marked was infiltrated with lignocaine 2% in dose of 3 mg/kg and bupivacaine 0.25% in dose of 2 mg/kg. After making skin incisions, galea and periosteum separation was done using tenotomy scissors, the craniectomy was performed by the neurosurgeon, and bleeders from cut bone ends were controlled using bone wax. Through the craniotomy, we placed the zero-degree scope with shaft, connected to a bipolar footplate, to perform the dissection of the dura mater from the overlying synostotic suture line and assisted by suctioning. Under vision using the endoscope, the entire length of the suture was dissected. All bridging veins were coagulated under vision with a bipolar cautery. The fused suture segment was excised up to a width of 2.5 cm in its entirety [Figure 4]. The surgical field was inspected for any active bleed. The galea was closed using 4-0 monofilament absorbable suture followed by closure of dermal layer with 6-0 absorbable monofilament suture. This was then sealed with cyanoacrylate glue application (Dermabond, Ethicon). No drains were used. The duration of surgery lasted about 60 min on an average. Postoperatively, the incision was dressed with Tegaderm pads, the baby was extubated in the operating room and was monitored in the neurosurgical intensive care unit for 12 h. Hemoglobin levels were checked 24 h after the surgery. Breastfeeding was initiated 6 h following surgery. Analgesia was managed using postoperative fentanyl infusion if necessary along with intravenous paracetamol. All our patients were shifted out of intensive care unit the next morning. The following day the dressing was opened to assess the stitch line, babies were given a head bath and then discharged. The average age at surgery was 92.6 days postbirth (84–100 days). Five out of the six babies we operated were female. None of our patients had any associated syndromes. Three babies had metopic craniosynostosis, two had bicoronal craniosynostosis, and one had right unicoronal craniosynostosis. 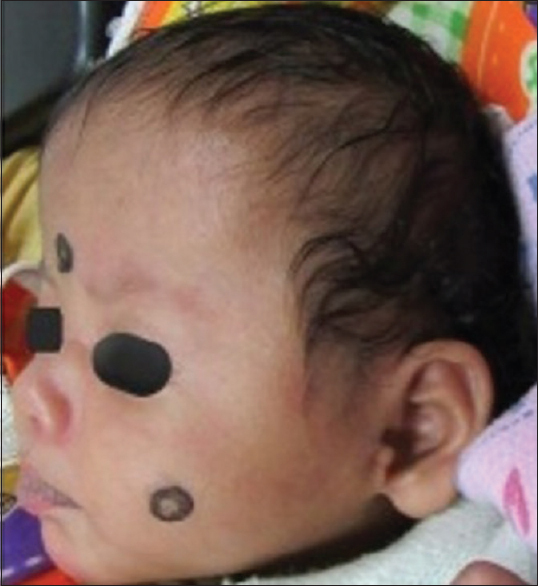 All babies with metopic craniosynostosis had complete correction of the preoperative hypotelorism and increase in the interpupillary distance [Figure 27] and [Figure 28]. Average length of hospitalization was 2–3 days. 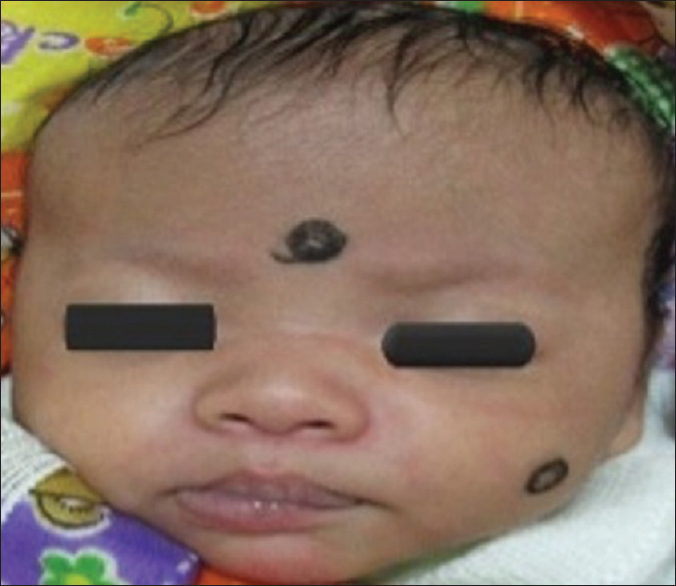 Nasal root deviation improved in all babies with coronal craniosynostosis [Figure 29] and [Figure 30]. None of our patients had dural tears or cerebrospinal fluid (CSF) leak. There was no need for blood transfusion since bleeding was minimal. Mean blood loss was around 55 ml (50 ml to 60 ml) and mean duration of surgery was 61.7 min (54–74 min). At 4-month follow-up, all our patients showed age-appropriate increase in the head circumference corresponding to the 50th centile [Figure 31]. 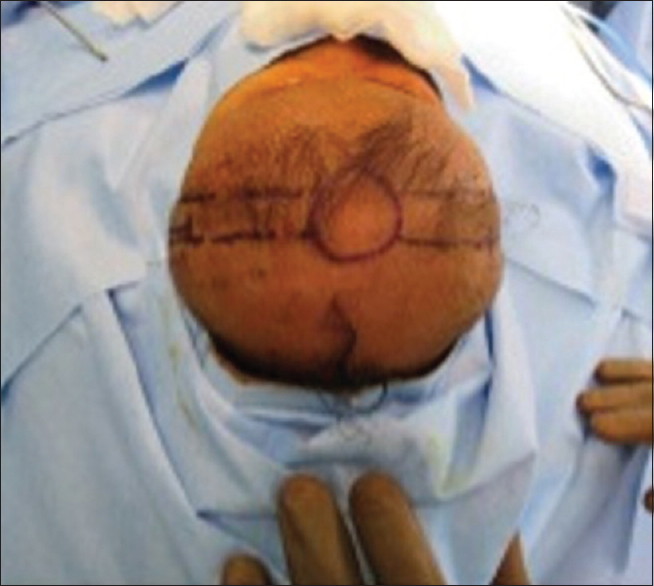 One of the patient's heads circumference corresponded to 60th centile at 4-month follow-up after surgery. All our patients went under the helmet on an average 2 weeks after the surgery due to logistical reasons. 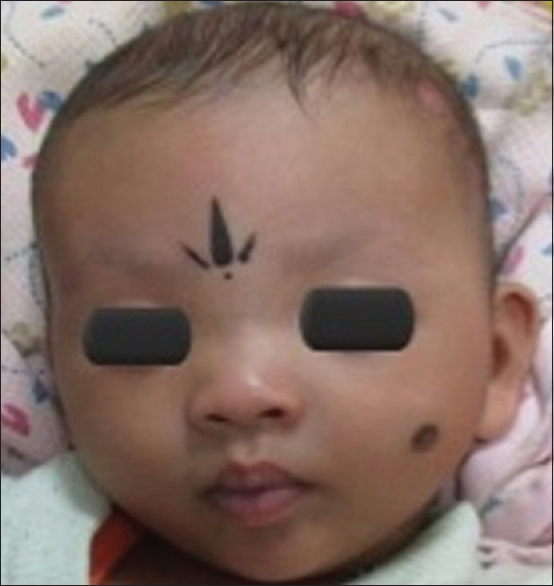 One baby had redness over the scalp following initiation of helmet therapy. This subsided after subtle correction of the dimensions of the helmet. There were no issues regarding noncompliance of helmet therapy. None of our patients have undergone revision surgery/open calvarial reconstruction. Parental satisfaction was good. Endoscopic craniosynostosis surgery is gradually being accepted by craniofacial and neurosurgeons worldwide. Jimenez and Barone have been pioneers in conceptualizing this surgical technique and publishing their results. In their retrospective analysis of 450 children with craniosynostosis corrected endoscopically, the results are a close comparison to our cohort of patients in terms of age of surgery. Most studies agree that 3 months is ideal time to perform this surgery,,, for ideal results. By this age, most babies including preterm have acquired significant weight and can tolerate minimal blood loss. 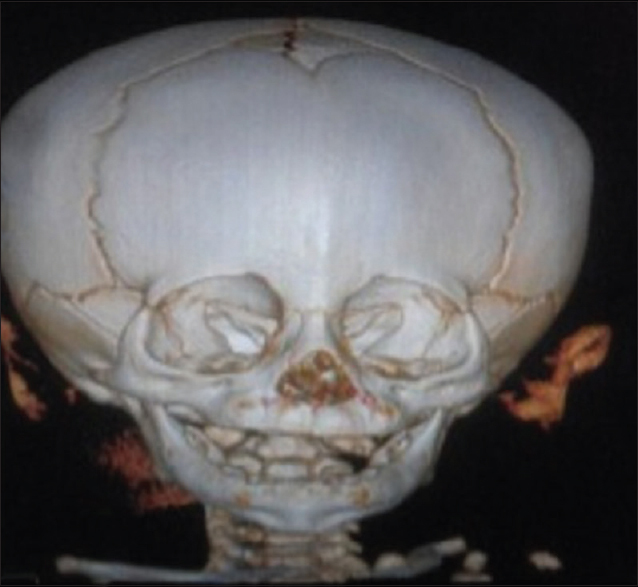 It is advised that in syndromic children, the surgery can be performed as early as 4–6 weeks to halt progressive deformity and prevent raised intracranial pressures and can be later followed up with other cranial vault expansion or advancement procedures. Jimenez and Barone showed that the cutoff age is 6 months for this procedure as the bone becomes hard after 6 months and the calvarial deformity has already set in, thereby cosmetic outcome achieved is insufficient. Almost all the studies have unanimously agreed that the blood loss, surgical and subsequent anesthetic duration, and length of hospitalization are markedly decreased with the procedure, and if operated at right age, does not require revision surgery. 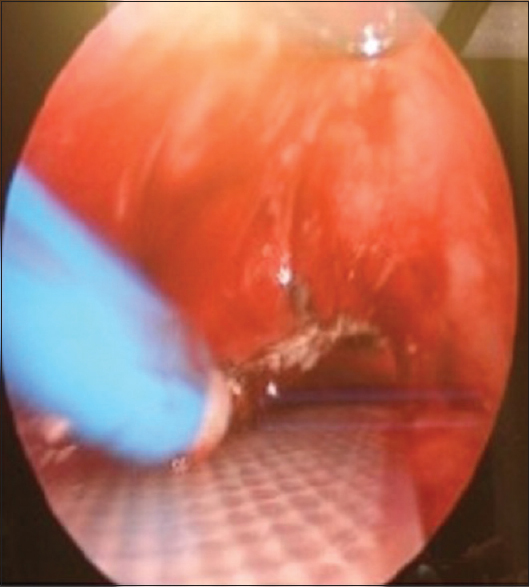 The expected complications are dural tear, CSF leak the incidence of which is similar to open correction, and possible requirement of open correction if endoscopic correction fails to correct deformity completely. Jimenez and Baron, in their massive retrospective analysis, found that one child operated for coronal craniosynostosis endoscopically needed blood transfusion intraoperatively, none postoperatively and 7 out of 100 children operated for metopic synostosis needed blood transfusion. Jimenez and Barone saw 100% improvement in hypotelorism postoperatively after endoscopic correction for metopic craniosynostosis. 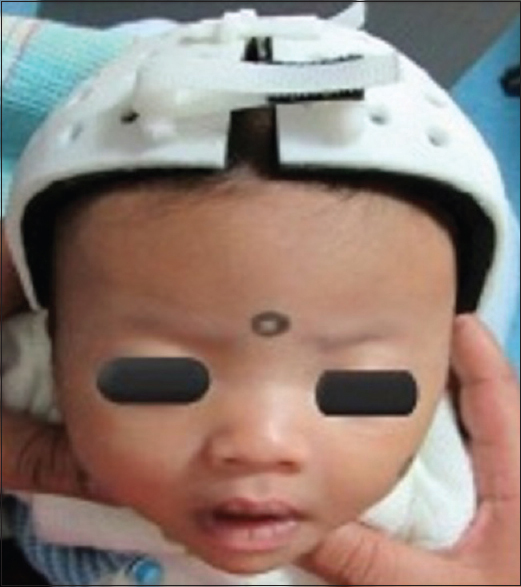 In babies with coronal craniosynostosis, they saw a complete correction of vertical dystopia in majority of their patients. 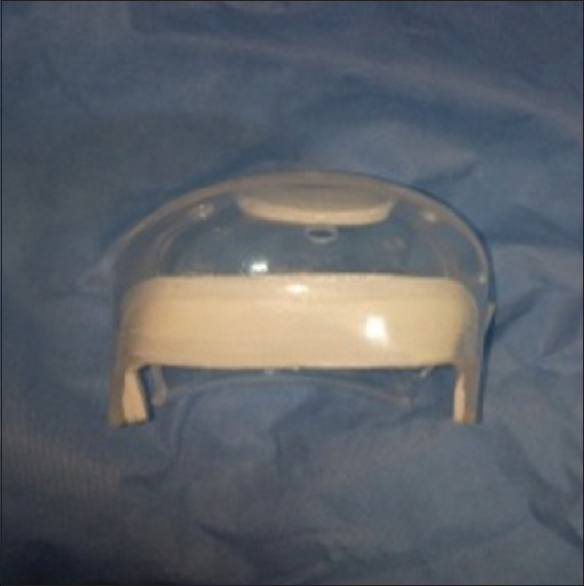 Critics of this technique would argue that since the successful postoperative outcome is largely dependent on helmet therapy, it could be a difficult feat to achieve in a population that is not well educated. However, it has been seen that careful counseling of the parents about the expected benefits and possible ill effects of noncompliance could be an incentive good enough to adhere to the therapy. Furthermore, at present, light weight options are available in these helmets to make the child more compliant for helmet therapy. Postoperatively, every child needs 2–3 helmets over the period up to 18 months of age for assisting calvarial molding with brain growth. 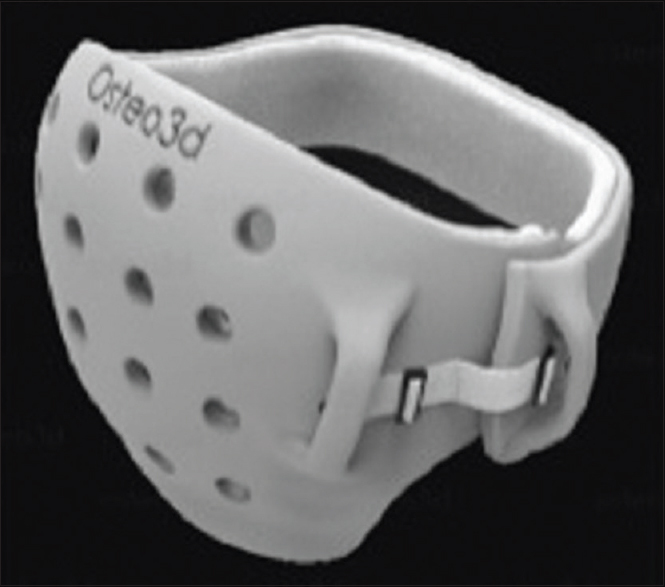 The imported light-weight helmet manufactured by OrthoAmerica costs Rs. 1–1.5 lakhs each, while the indigenous locally made orthotic helmet costs Rs. 30,000–50,000 each. In our experience, these surgeries are also cost-effective by reducing the duration of surgery, hospital stay, usage of consumables for the surgery, and requirement for major postoperative care with monitoring. The biggest challenge the craniofacial community faces is the lack of early referral for babies with these deformities, which is a key factor in deciding the surgical outcomes and play a role in reducing the surgical morbidity. Our experience has shown that with timely surgical intervention (within 6 months age), the endoscopic-assisted craniosynostosis surgical technique is effective, safe, and reliable provided postoperative helmet therapy is applied. 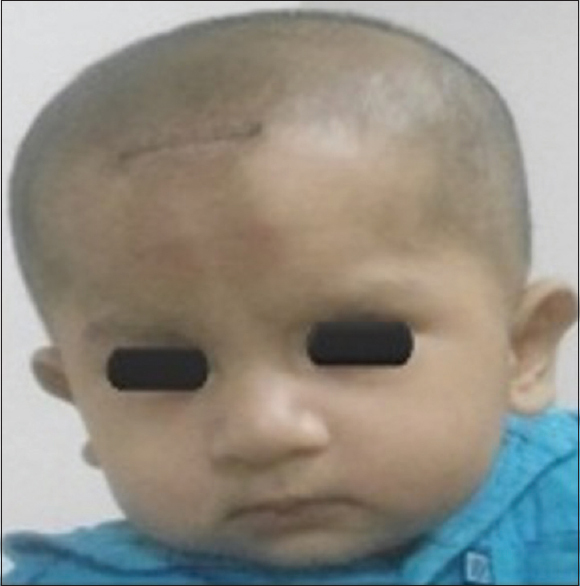 The authors present the first Indian series of patients who underwent endoscopic-assisted craniosynostosis correction. In our experience, if done at the right age and with careful parent counseling and follow-up for helmet therapy, this procedure could be the best available option for achieving least morbidity, excellent esthetic, and functional outcomes for babies with craniosynostosis. Proctor MR. Endoscopic craniosynostosis repair. Transl Pediatr 2014;3:247-58. Sharma RK. 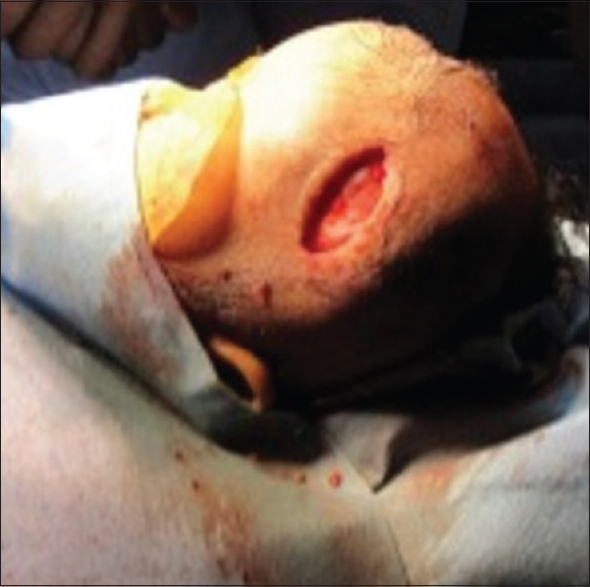 Craniofacial surgery in a tertiary care center in India. J Craniofac Surg 2014;25:1594-600. 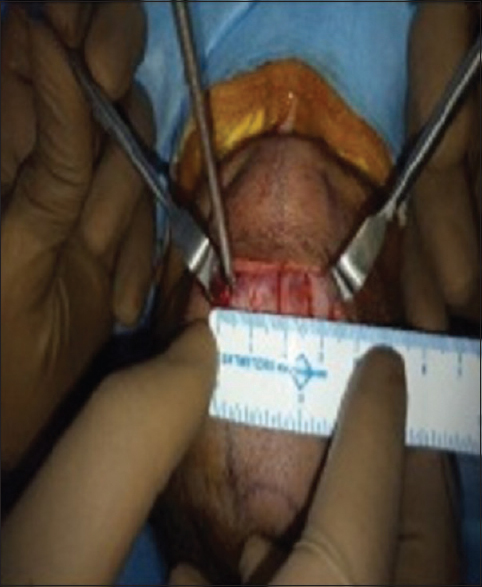 Hoffman HJ, Mohr G. Lateral canthal advancement of the supraorbital margin. 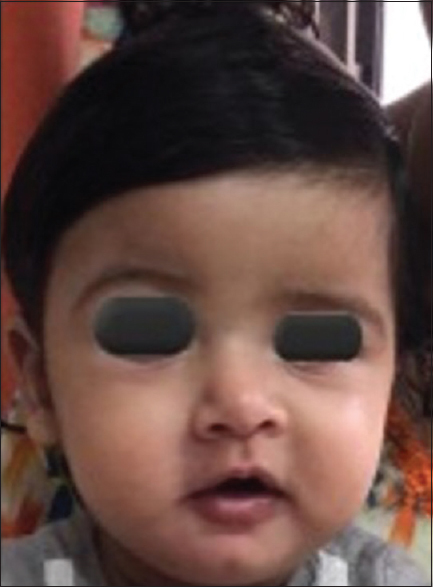 A new corrective technique in the treatment of coronal synostosis. J Neurosurg 1976;45:376-81. Whitaker LA, Schut L, Kerr LP. Early surgery for isolated craniofacial dysostosis. Plast Reconstr Surg 1997;91:977. 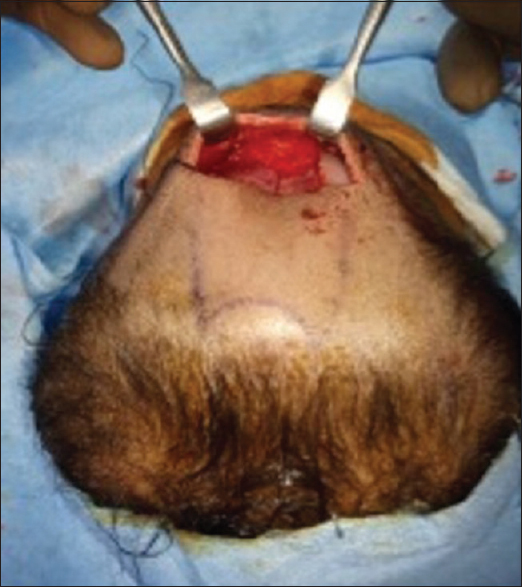 Marchac D. Radical forehead remodeling for craniostenosis. Plast Reconstr Surg 1978;61:823-35. Marchac D, Remier D. “Le Front Flottanz”: Treatment precoce des facio- craniostenoses. Ann Chir Plast 1979;24:121. Rosnick JC. 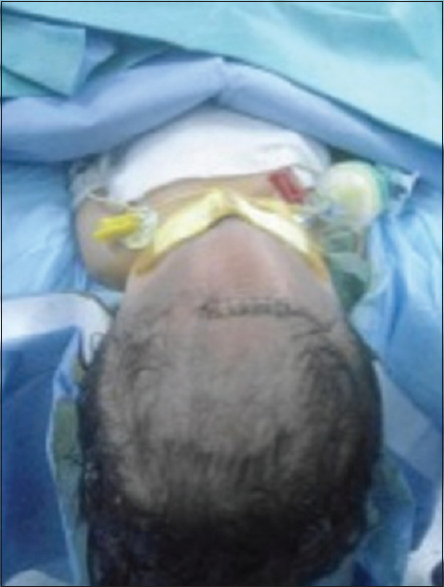 Craniosynostosis: Surgical management in infancy. In: Bell WH, editor. Orthognathic and Reconstructive Surgery. Philadelphia: W.B. Saunders; 1992. p. 1839-87. Posnick JC. 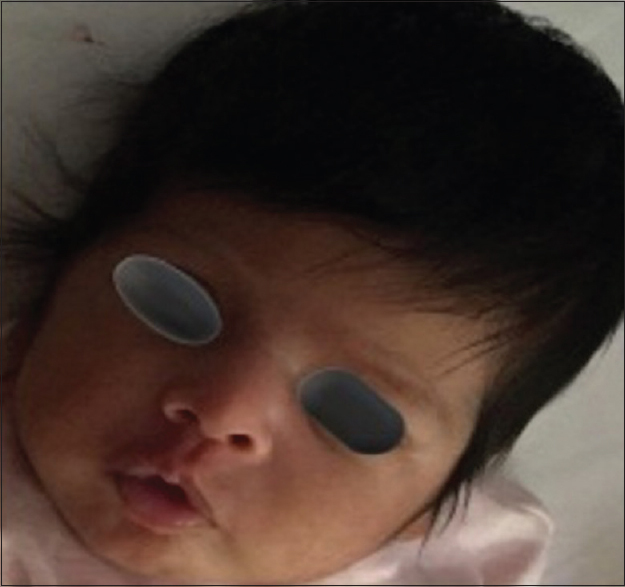 Unilateral coronal synostosis (anterior plagiocephaly): Current clinical perspectives. Ann Plast Surg 1996;36:430-47. Barone CM, Jimenez DF. 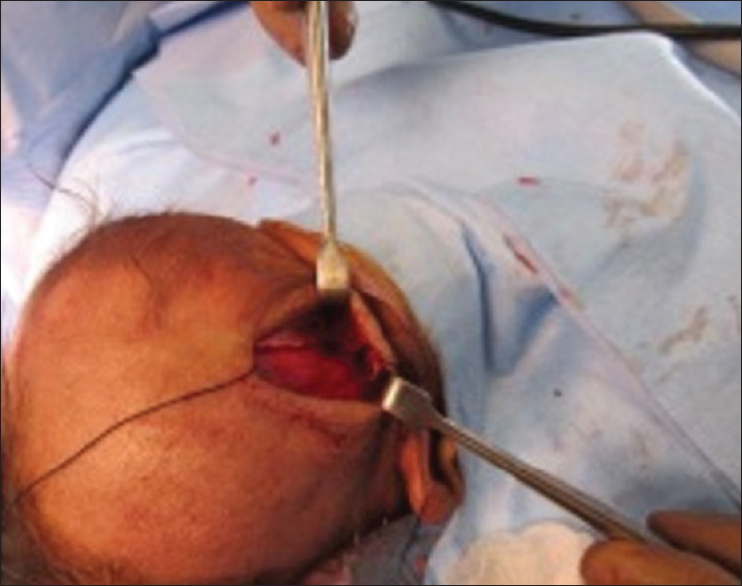 Endoscopic craniectomy for early correction of craniosynostosis. Plast Reconstr Surg 1999;104:1965-73. Lannelongue M. De la craniectomie dans la mircocephalie. Compt Rend Seances Acad Sci 1890;50:1382-5. Jimenez DF, Barone CM. Endoscopic techniques for craniosynostosis. Atlas Oral Maxillofac Surg Clin North Am 2010;18:93-107. Delye HHK, Borstlap WA, van Lindert EJ. Endoscopy-assisted craniosynostosis surgery followed by helmet therapy. Surg Neurol Int 2018;9:59. Berry-Candelario J, Ridgway EB, Grondin RT, Rogers GF, Proctor MR. Endoscope-assisted strip craniectomy and postoperative helmet therapy for treatment of craniosynostosis. Neurosurg Focus 2011;31:E5. Proctor MR. Endoscopic cranial suture release for the treatment of craniosynostosis – Is it the future? J Craniofac Surg 2012;23:225-8. Rivero-Garvía M, Marquez-Rivas J, Rueda-Torres AB, Ollero-Ortiz A. 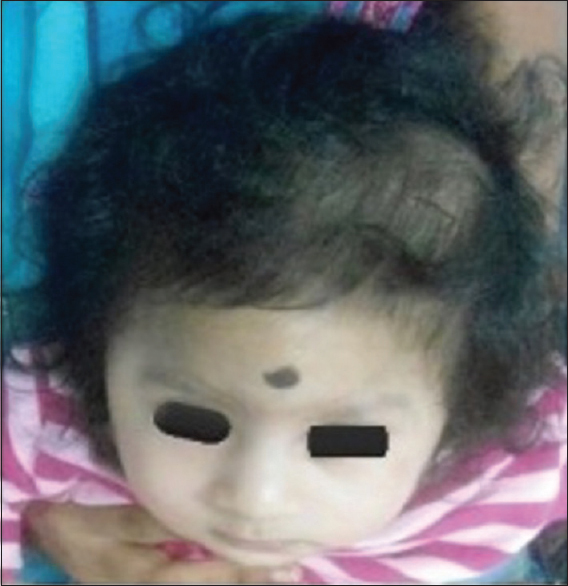 Early endoscopy-assisted treatment of multiple-suture craniosynostosis. Childs Nerv Syst 2012;28:427-31. Shah MN, Kane AA, Petersen JD, Woo AS, Naidoo SD, Smyth MD, et al. 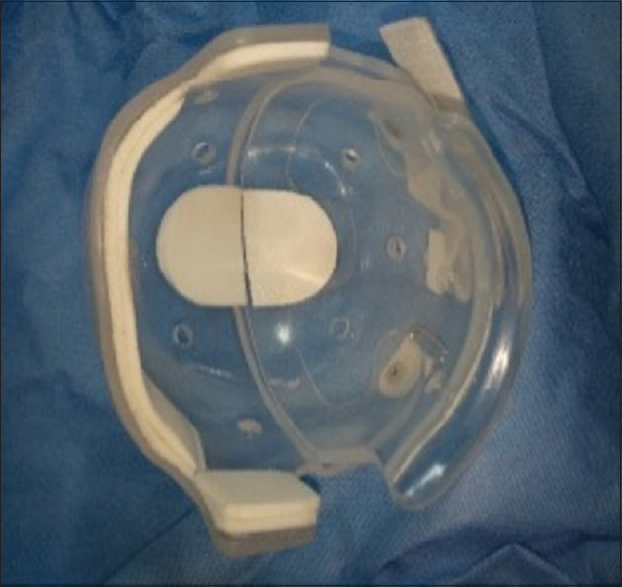 Endoscopically assisted versus open repair of sagittal craniosynostosis: The St. Louis children's hospital experience. J Neurosurg Pediatr 2011;8:165-70. Arts S, Delye H, van Lindert EJ. 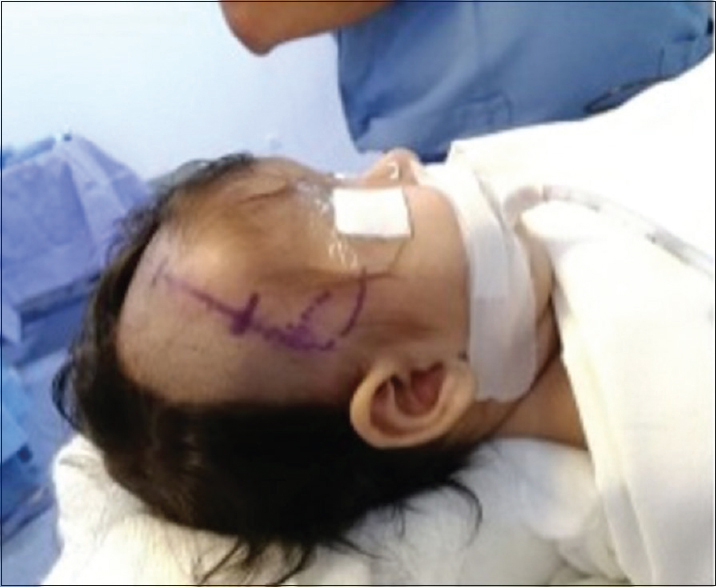 Intraoperative and postoperative complications in the surgical treatment of craniosynostosis: Minimally invasive versus open surgical procedures. J Neurosurg Pediatr 2018;21:112-8.